My Uncle Frankie passed away last Saturday. I had just been thinking about him earlier that day wondering about his health; he was well into his 80s and his health had been deteriorating. He was one of my favorite uncles. I never tired of the same corny jokes or life stories he told whenever our families got together. For years now, I have become the point of contact for my family, so when I received the call about Uncle Frankie’s death, I called the rest of the family. But I had a dilemma: my sister Michelle and I have been estranged from one another for longer than I care to mention and for reasons I cannot remember. Our silence lasted months then years and inaction seemed easier even though I thought about her often and missed her deeply; I longed to talk to her. Should I call her about Uncle Frankie or continue our silence? I called, left a message with as much information as I had and then waited. It was lovely to hear Michelle’s voice two days later and it immediately filled my heart with tenderness. We caught up on the major events that occurred in our lives since we last saw each other. She’d seen some of the fitness photos I’d posted on my blog, and we reminisced about our aerobic craze to keep fit, fad diets and the nicknames we had for each other as we lost weight. As we talked about the lifestyle I have created for myself, it got me to thinking how critical it is to have enriching, supportive relationships as part of an overall balanced healthy life. My relationship with her has brought a tremendous amount of joy over the years and also a lot of pain and angst but my life is surely richer and more complete experiencing the range of emotions and issues with her in my life than without. I am terribly sad that my Uncle Frankie passed away, but I will be forever grateful that it gave me and my sister a new beginning. I look forward to writing the next chapter of my life that includes her and her family. Rest in peace Uncle Frankie I love you. You are responsible for everything that happens in your life. Learn to accept total responsibility for yourself. If you do not manage yourself, then you are letting others have control of your Life. These tips will help "you" manage "you." 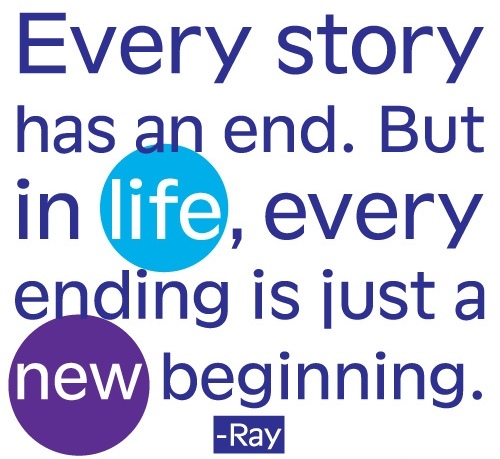 -) Look at every new opportunity as an exciting and new-life experience. -) Be a professional who exhibits self-confidence and self-assurance in your potential to complete any task. -) Agree with yourself in advance that you will have a good attitude toward the upcoming task. -) Frequently ask, "Is what I am doing right now moving me toward my goals?" -) Do it right the first time and you will not have to take time later to fix it. -) Accept responsibility for your job successes and failures. Do not look for a scapegoat. -) Do not view things you do as a "job." View all activities as a challenge. -) Use your subconscious mind by telling it to do what you do want. Instead of telling yourself, "I can't do that very well," say, "I can do this very well." 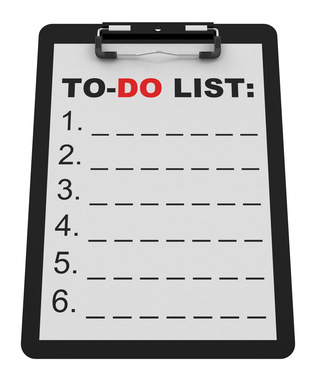 -) Give yourself points for completing tasks on your "to-do" list in priority order. When you reach 10 points, reward yourself. -) Practice your personal beliefs. 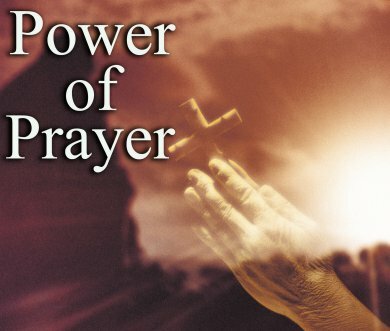 It may be helpful each morning to take 15 minutes to gather your thoughts and say a prayer. -) Make a commitment to show someone a specific accomplishment on a certain date. The added urgency will help you feel motivated to have it done. 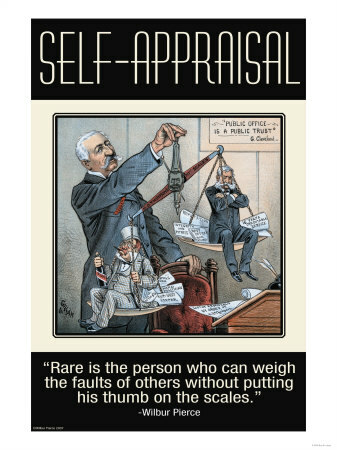 -) Practice self-determination, wanting to do it for yourself. -) Believe that you can be what you want to be. -) Never criticize yourself as having a weakness. You do not have any weakness, only untapped potential. -) Be pleasant all the time-no matter what the situation. 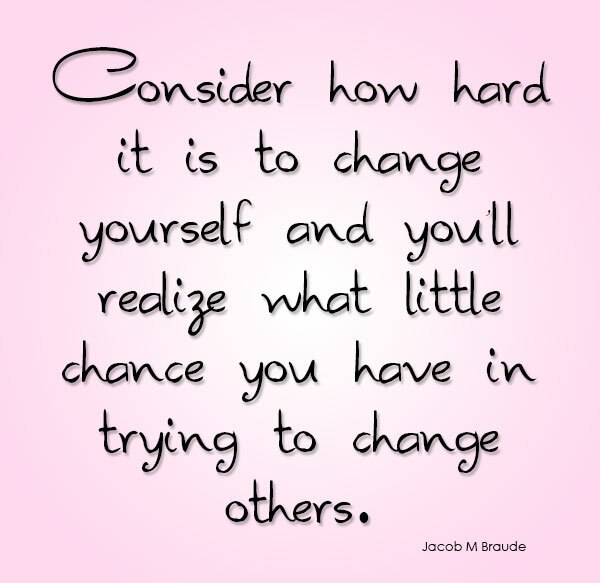 -) Challenge yourself to do things differently than you have in the past. It provides new ideas and keeps you interested. -) Talk to yourself. A self-talk using positive affirmation is something that is common among all great achievers. -) Establish personal incentives and rewards to help maintain your own high enthusiasm and performance level. A kindergarten teacher has decided to let her class play a game. The teacher told each child in the class to bring along a plastic bag containing a few potatoes. so the number of potatoes that a child will put in his/her plastic bag will depend on the number of people he/she hates. So when the day came, every child brought some potatoes with the name of the people he/she hated. Some had 2 potatoes; some 3 while some up to 5 potatoes. The teacher then told the children to carry with them the potatoes in the plastic bag wherever they go (even to the toilet) for 1 week. The teacher asked: "How did you feel while carrying the potatoes with you for 1 week?". The children let out their frustrations and started complaining of the trouble that they had to go through having to carry the heavy and smelly potatoes wherever they go. Then the teacher told them the hidden meaning behind the game. The teacher said: "This is exactly the situation when you carry your hatred for somebody inside your heart. 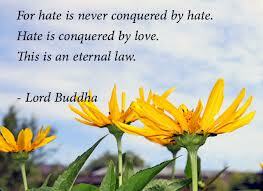 The stench of hatred will contaminate your heart and you will carry it with you wherever you go. If you cannot tolerate the smell of rotten potatoes for just 1 week, can you imagine what is it like to have the stench of hatred in your heart for your lifetime???" Moral of the story: Throw away any hatred for anyone from your heart so that you will not carry sins for a lifetime. Forgiving others is the best attitude to take! True love is not loving a perfect person but loving an imperfect person perfectly!! There is a field, with two horses in it. From a distance, each horse looks like any other horse. But if you stop your car, or are walking by, you will notice something quite amazing. 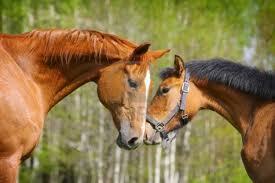 Looking into the eyes of one horse will disclose that he is blind. His owner has chosen not to have him put down, but has made a good home for him. If you stand nearby and listen, you will hear the sound of a bell. smaller horse in the field. horse is, so he can follow. walk to where the other horse is, trusting that he will not be led astray. When the horse with the bell returns to the shelter of the barn each evening, it stops occasionally and looks back, making sure that the blind friend isn't too far behind to hear the bell. Like the owners of these two horses, God does not throw us away just because we are not perfect or because we have problems or challenges. He watches over us and even brings others into our lives to help us when we are in need. Leave the rest to God!!! * It is an important mechanism that will help to reach the goal, without the external influence. as well as gives strength to achieve the goal. * Self Motivation is a more efficient method. 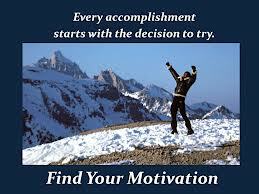 * If you can motivate yourself, you don't have to depend on any external method. control the crowd within the room. The more people reached the coffin, the more the excitement heated up. deepest part of their soul. success. 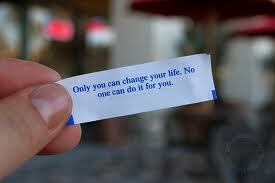 You are the only person who can help yourself. one responsible for your life. impossibilities and losses: be a winner, build yourself and your reality. It's the way you face life that makes the difference!!! A voyaging ship was wrecked during a storm at sea and only two of the men on it were able to swim to a small, desert like island. had no other recourse but to pray to God. However, to find out whose prayer was more powerful, they agreed to divide the territory between them and stay on opposite sides of the island. The first thing they prayed for was food. The next morning, the first man saw a fruit-bearing tree on his side of the land, and he was able to eat its fruit. The other man's part of land remained barren. After a week, the first man was lonely and he decided to pray for a wife. The next day, another ship was wrecked, and the only survivor was a woman who swam to his side of the land. On the other side of the island, there was nothing. Soon the first man prayed for a house, clothes, and more food. The next day, like magic, all of these were given to him. However, the second man still had nothing. Finally, the first man prayed for a ship, so that he and his wife could leave the island. In the morning, he found a ship docked at his side of the island. The first man boarded the ship with his wife and decided to leave the second man on the island. He considered the other man unworthy to receive God's blessings since none of his prayers had been answered. As the ship was about to leave, the first man heard a voice from heaven booming, "Why are you leaving your companion on the island?" "My blessings are mine alone, since I was the one who prayed for them," the first man answered. "His prayers were all unanswered and so he does not deserve anything." "You are mistaken!" the voice rebuked him. "He had only one prayer, which I answered. If not for that, you would not have received any of my blessings." "Tell me," the first man asked the voice, "What did he pray for that I should owe him anything?" He prayed that all your prayers be answered." For all we know, our blessings are not the fruits of our prayers alone, but those of another praying for us. With love comes a blessing. My prayer for you today is that all your prayers are answered. Sitting in the Geography class in school, I remember how fascinated I was when we were being taught all about the Dead Sea. As you probably recall, the Dead Sea is really a Lake, not a sea (and as my Geography teacher pointed out, if you understood that, it would guarantee 4 marks in the term paper!). It is so high in salt content that the human body can float easily. You can almost lie down and read a book! The salt in the Dead Sea is as high as 35% - almost 10 times the normal ocean water. And all that saltiness has meant that there is no life at all in the Dead Sea. No fish. No vegetation. No sea animals. Nothing lives in the Dead sea. And hence the name: Dead Sea. While the Dead Sea has remained etched in my memory, I don't seem to recall learning about the Sea of Galilee in my school Geography lesson. So when I heard about the Sea of Galilee and the Dead Sea and the tale of the two seas - I was intrigued. Turns out that the Sea of Galilee is just north of the Dead Sea. 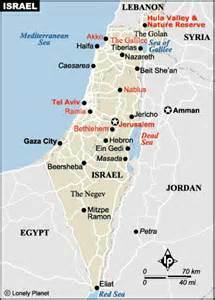 Both the Sea of Galilee and the Dead Sea receive their water from river Jordan. And yet, they are very, very different. Unlike the Dead Sea, the Sea of Galilee is pretty, resplendent with rich, colourful marine life. There are lots of plants. And lots of fish too. In fact, the sea of Galilee is home to over twenty different types of fishes. Same region, same source of water, and yet while one sea is full of life, the other is dead. How come? Here apparently is why. The River Jordan flows into the Sea of Galilee and then flows out. The water simply passes through the Sea of Galilee in and then out - and that keeps the Sea healthy and vibrant, teeming with marine life. But the Dead Sea is so far below the mean sea level, that it has no outlet. The water flows in from the river Jordan, but does not flow out. There are no outlet streams. It is estimated that over a million tons of water evaporate from the Dead Sea every day. Leaving it salty. Too full of minerals. And unfit for any marine life. The Dead Sea takes water from the River Jordan, and holds it. It does not give. Result? No life at all. Think about it. Life is not just about getting. 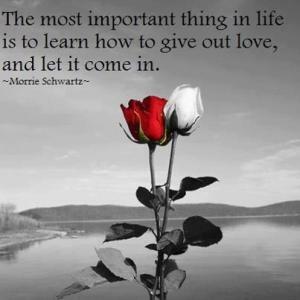 Its about giving. We all need to be a bit like the Sea of Galilee. We are fortunate to get wealth, knowledge, love and respect. But if we don't learn to give, we could all end up like the Dead Sea. The love and the respect, the wealth and the knowledge could all evaporate. Like the water in the Dead Sea. If we get the Dead Sea mentality of merely taking in more water, more money, more everything the results can be disastrous. Good idea to make sure that in the sea of your own life, you have outlets. Many outlets. For love and wealth - and everything else that you get in your life. Make sure you don't just get, you give too. Open the taps. And you'll open the floodgates to happiness. Make that a habit......to share.....to give. And experience life......experience the magic!!! The most important thing in life..................GOD!!! Avoid Negative Thoughts, People, Things and Habits. Consider things from every angle and others points of view. Energy, Excitement and Enthusiasm is in your blood. Family and Friends are hidden treasures ; enjoy these riches. Have a good sense of humour. Ignore Criticism, Ridicule and Discouragement from others. Jump on Problems because they are Opportunities in disguise. Keep up the good work however hard it may seem. Love yourself, just as you are. Open your eyes and see things as they really are. Prefect Practice makes you perfect. Quitters never Win and Winners never Quit. Reward yourself for every small success and achievement. Stop Wasting your Time and Procrastinating important Goals. Take control of your Life and your Goals. Understand so that you could understood! Visualize your Goals and Dreams everyday. Win over your own weaknesses and make them as your Strengths. Zap your Stress and Enjoy your Life..
1. Never laugh at anyone's dreams. 2. Don't let a little dispute injure a great friendship. to go ahead of you. 5. Ask anyone giving directions to repeat them at least twice. 6. Rehearse a joke before telling it. 7. Accept a breath mint if someone offers you one. 8. Over-estimate travel time by fifteen minutes. 9. Someone will always be looking at you as an example of how to behave. 10. Give people more than they expect, and do it cheerfully. 11. Don't be so concerned with your rights that you forget your manners. 12. Don't dismiss a good idea simply because you don't like the source. 13. Put the strap around your neck before looking through binoculars. 14. Trust in God, but lock your car. 15. Pray. There is immeasurable power in it. 16. Brush your teeth before putting on your tie. 17. Never ask your barber if you need a haircut. in the presence of others. 19. When you say "I am sorry" look at the person in the eye. 20. 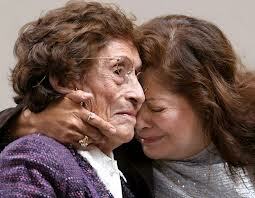 No matter how old you get, hug and kiss your mother. 21. Phone home if you are going to be more than 20 minutes late. 22. Remember that everyone is influenced by kindness. 23. Never be the first to break a family tradition ( as far as possible). and say, "Do you really want to know?" 26. Be friendly to the janitor as you are to the chairman of the board. 29. Never marry a woman you love. Marry the woman who loves you. 30. Never say NO to life. 31. When it comes to worrying or painting a picture, know when to stop. 32. Remember that no time spent with your children is ever wasted. when he or she won't let you. Recently, I overheard a mother and daughter in their last moments together at the airport as the daughter’s departure had been announced. The daughter replied, “Mom, our life together has been more than enough. They kissed and the daughter left. I could see she wanted and needed to cry. next trip back will be for my funeral,” she said. She began to smile. “That’s a wish that has been handed down from other generations. life filled with just enough good things to sustain them”. My friends, I wish you enough! 1. Stand for something or you will fall for anything! where you are or where you have been! 3. Invest on knowledge, it will give you the best interest! 4. Don't forget beauty is skin deep!5. If you don't practice in your problems, on your OWN, you will DIE! 6. Success is not much what you are; BUT, rather what you appear to be! 7. Things would happen, but it takes time! 8. Suffering is not a punishment, but it's the result! 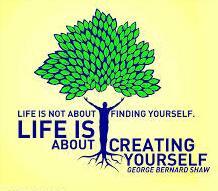 LIFE IS ABOUT CREATING YOURSELF!. There was once an earnest gardener who loved his work and his produce. One day he was walking through his delightful garden and happened to notice a weed. The gardener was particularly tired so he decided to leave it. The next day he had to leave to visit his relatives in another country for two weeks. When he came back, the back yard was covered in weeds and all his produce was dead! Likewise, if we allow just one bad thought in our head and fail to remove it, it will sprout and instead of having to pick one weed, we will have too much to control. If we destroy our negative thoughts, by allowing positive ones to grow, they will display in our personality like a beautiful garden. Thats the power of positive thought.We are, what our thoughts are. We should always entertain only good and positive thoughts in our mind and never give way for anything negative! A little boy went into a drug store, reached for a soda carton and pulled it over to the telephone. He climbed onto the carton so that he could reach the buttons on the phone and proceeded to punch in seven digits. The boy asked, "Lady, Can you give me the job of cutting your lawn? The woman replied, "I already have someone to cut my lawn." "Lady, I will cut your lawn for half the price of the person who cuts your lawn now." replied the boy. The woman responded that she was very satisfied with the person who was presently cutting her lawn. so on Sunday you will have the prettiest lawn in all of Palm beach , Florida." Again the woman answered in the negative. With a smile on his face, the little boy replaced the receiver. "Son... I like your attitude; I like that positive spirit and would like to offer you a job." The little boy replied, "No thanks, I was just checking my performance with the job I already have. I am the one who is working for that lady, I was talking to!" "Think BIG. 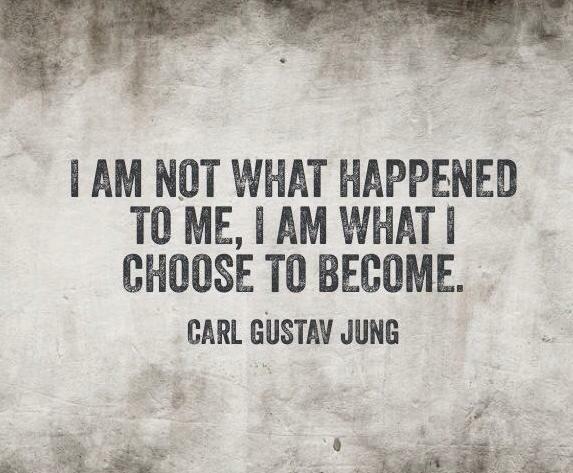 As you think, so you become "
Carl Jung, a Swiss psychologist and psychiatrist who founded analytical psychology. Jung proposed and developed the concepts of the extraverted and the introverted personality, archetypes, and the collective unconscious. His work has been influential in psychiatry and in the study of religion, literature, and related fields. I believe that we all take charge of shaping our fate and determining our own destiny (believe, work hard, pray) ; but when we kept being told that we hold a master number and was born to inspire, I guess it just feels good and validated all over again. You imagine what you desire, you will what you imagine and at last you create what you will. in Literature (1925) and an Oscar (1938). Imagination, also called the faculty of imagining, is the ability of forming mental images, sensations and concepts, in a moment when they are not perceived through sight, hearing or other senses. 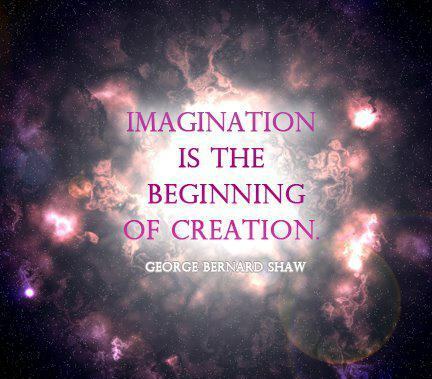 Imagination is the work of the mind that helps create. Imagination helps provide meaning to experience and understanding to knowledge; it is a fundamental facility through which people make sense of the world, and plays a key role in the learning process. Imagination is the faculty through which we encounter everything. The things that we touch, see and hear coalesce into definite forms through the processes of our imagination. 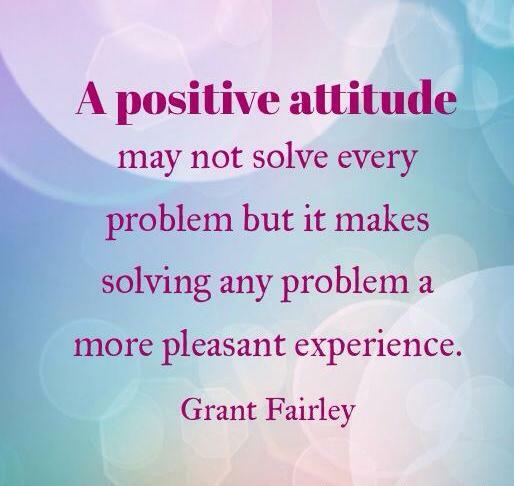 Are you aware of the importance of a positive attitude in your life? Most people aren't. If you are one of the few that are reading this article, you will be light years ahead of most other people in this world. Ahead of them how? You might ask. A good question. The short answer is in the most important measurement of all - how happy you are. Sure, there are plenty of other benefits of a positive attitude. But first, let me elaborate on why your personal happiness is the most important benefit, and the importance of a positive attitude in helping you achieve it. Your happiness is the most important aspect of your life. Why do I say this? Because if you really examine everything you do, and everything you want to have, I would bet that it's because you believe doing and having those things will make you happy. Am I right? If you want a new car, or a new relationship, why do you want those things. Ultimately, it's because you believe these things will make you happy. Being happy is really the main goal of pretty much every living person on this planet earth. Once you understand that happiness is your true goal, you also start to understand that new stuff, new relationships, and new achievements aren't really what you are after. Sure, they might be nice side benefits, but if you were happy now, would any of that stuff really matter to you much? This is where the importance of a positive attitude comes in. When you start developing a positive attitude in your life. You begin to look at what is already good in your life, and start to have more gratitude for what you already have. Instead of focusing on what is lacking and what is wrong in your life, you refocus on what you have already been blessed with. Living life with a sense of gratitude instead of feelings of lack and frustration will cause you to feel happy. When you already feel happy, all of those other things you thought you wanted or needed suddenly only become stuff that would be nice to have. And when that happens, your happiness is no longer dependent on other people, places, things, or achieving goals. 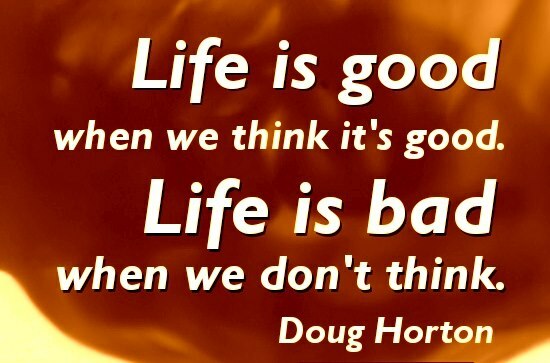 The interesting thing is, that once you move in to a state of hootlessness (to borrow a term from the Sedona Method course) about getting what you want, you actually start getting more great things happening in your life. You see, when you move from a state of "must have" to "nice to have", you have dropped all the resistance out of your vibration. And when the resistance is gone, the law of attraction can move things in to your life at a much faster pace. Ok, so the importance of a positive attitude for achieving happiness is well understood. But what are some of the other reasons that a positive attitude is important? 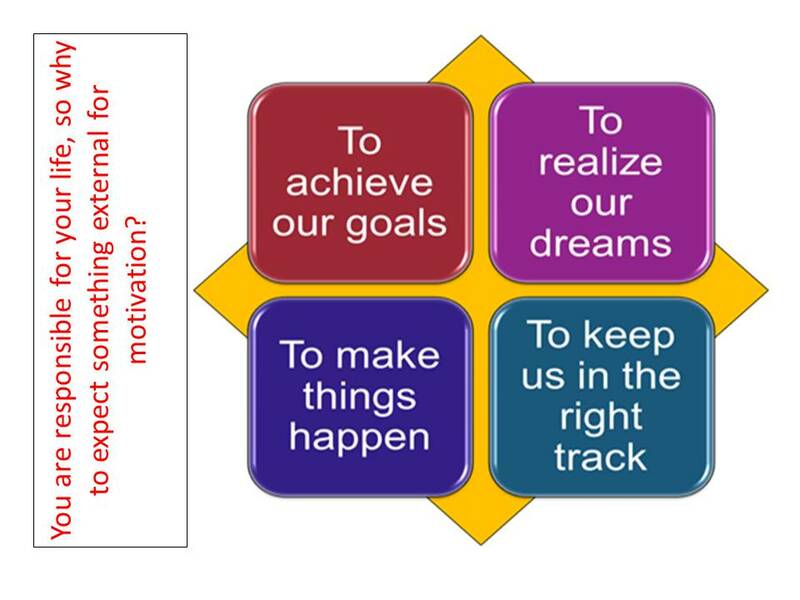 You are more motivated to get things done and achieve your goals when you have a positive attitude. You expect positive outcomes and results, and you usually get them. Problems are no longer problems, but become opportunities to learn and grow. You have higher self-esteem. You believe in yourself and what you are capable of. You see opportunities where other people see problems. Your thinking is more creative. You have more inspiration and you rely less on others to help motivate you. You are generally much happier. You have much less stress. Your health is better because you are less stressed. Your immune system is stronger. You will live a longer life. You have more friends. Who wants to hang out with somebody who is negative? People will respect you more. You make a better leader or manager. Your significant other will like being around you more. Achieving success is easier and more fun. You have more energy. Negativity can really drain you! You will affect others have a more positive attitude. Attitudes are contagious. You bounce back from setbacks much faster. You enjoy your work more. Your kids will like being around you more. You enjoy more success in all areas of life. Hopefully this has helped convince you of the importance of a positive attitude. In the journey of life, it is unavoidable that there are times of high tides and low tides. Now and then, there are happy times; now and then, there are sad times; now and then, there are lonely times. We fall and we bleed. We must soothe and treat our wounds. As we often encounter undesirable matters, how would we subdue these undesirable circumstances within the undesirable? Do not allow our seeds to turn bad and bear bad fruits. Goodness and evil, one is Heaven and one is Hell. If the heart is evil, all actions will be evil. If the heart is enlightened, then one will tell the Truth. All actions mean more than words. Let your actions be all good. The compassion from the above is like parents' feeling towards their children. They love their children more than anything else. If their children are to take the wrong road and do nothing but evil deeds, what do you think the parents will do? Their hearts will then feel painful, as if it has been stabbed by a knife, but in order to help the children, punishment must be given. If you punish one child, the second and the third will then take heed. If parents do not punish their children, who do you think will punish them? Natural disasters, calamities and finally the final catastrophe. Why do they have to take place and what are their purpose? To stop the sin of human from never ending cycle of killing. It is better for Heaven to send down calamities to end the bad karma than sending humans to kill humans in the thousands and millions. The question often asks by human; why are there evils on earth? The answer is where there is sky, there is land. Being short one realizes what tall means. All things must have opposites. Where "Yang" is seen, one will find "Yin". With goodness, there is evil. By understanding well what is bad, one will keep away from it. With evil, the path is then complete. For if evil is not sighted, then one may not see the Truth or Tao. Why do man realize his wrongs and yet still repeat them? Everyday man eats and he will continue to do so until death. The human world is filled with temptations. Although a wrong is made, man may be so blinded by the dust that he may not be able to see. Attachment is the main weakness of man. It may be difficult for a person to remedy the mistake if his feelings and disires for attachment grow and he does not know how to detach and let go. The wrong may be merely temptations that pull him away from the path and start doing right. Stillness and awakening to the realization of life, may help one to see things in a better form. It may help man to turn back and realize the Truth about life, and why one has to be good instead of bad. The good may be poor and the bad may be rich. What is actually poor and what is actually rich? The poor may be poor in terms of money and wealth but their knowledge is abundant. A person who has a hundred thousand dollars may still find a day or two to serve the people but a millionaire may not have the time to even go to the toilet or to eat. Poor but not without good food and sleep, rich but may not have good food and sleep. Simple but happy, so why worry about rich or poor. The civilization of human beings can save people, but it can harm people too. Some people use it to do good, it is fine. If it is used to do evils and wrongs, it would harm everybody. Nowadays, there are people fighting for their religions and causing religious conflicts. Religions are meant to be good and not bad. Misused it, the world will not be at peace; is the world at peace? Good and Bad come from the same place. Follow the steps of the Sages and Saints and may there be peace on earth. If kindness is the act of being kind as defined by the dictionary, it means "caring about others; gentle, friendly and generous". However, I believe that the definition can be extended and better encompassed by the Australian Kindness Movement which states "an act of kindness is a message from one heart to another, an act of love, an unspoken "I care" statement". Kindness, when allowed to flourish, is an all pervasive, all transcending, flowing current which sustains mankind and which is absolutely fundamental within our society and world. If we are to establish the value of kindness, then we must find a scale on which to measure it. In the most logical way to deduct the value of something, then let us use the scale which is most commonly called upon in our society, cost. Kindness can cost a pound put towards helping a homeless person to stay in a shelter for the night, a fifty pound donation towards the aid of the distressed and displaced flood victims in some countries, or the sum of a cheque written to help a friend in need. However, a kind word is free, as is sharing your umbrella in the rain, or stopping to ask someone if they are lost and need help. What's more, to try and put kindness on a monetary scale would be to say that the �20 given to charity from the pocket of someone on minimum wage is less valuable than the �10 000 donation from a large multinational corporation, which simply is not true, as the means available to people are so different. The relative value of an act of kindness carried out by any person or group has no direct correspondence with the importance of the act. The value of kindness can also be discussed in terms of time; the two minutes that it takes to help somebody carry their pushchair up the stairs at the train station, the thirty minutes a month where you volunteer to visit a residential care home and chat to an elderly person who is lonely, or the month spent sharing your flat with a distant cousin who is down on their luck. But this scale is also insufficient, as the time taken to carry out a kind act is only a small part of the overall duration of its effect. For example, a smile takes only a moment, but could change somebody's mood for the whole day. A few words of encouragement or reassurance can stay with a person and continue to help them to overcome difficulties for many years after they were spoken. Indeed it could be argued that the effects of certain kind acts can continue indefinitely. 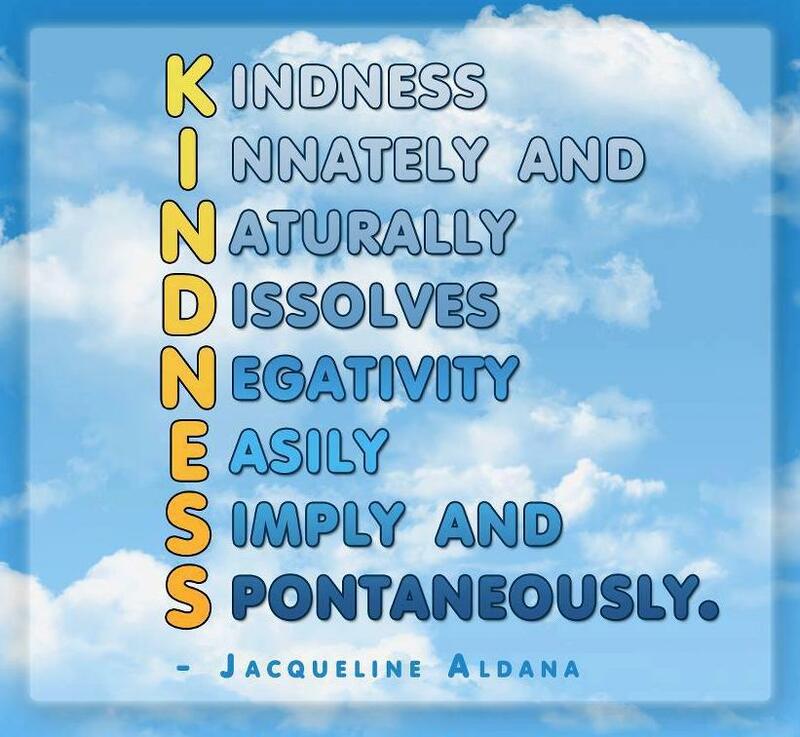 So although kindness can not be given a concrete and tangible value, this in no ways means that kindness is without value- in fact kindness can be viewed as quite invaluable. It is necessary to us, so much so that Goethe described kindness as ..."the golden chain by which society is bound together". Kindness within a society is essential and absolutely necessary in order for humans to coexist and live even relatively harmoniously in such large groups. More so, it is safe to presume that the more kindness existing in any society, the more harmony there is likely to be. In this way we can begin to perceive the beautiful flow of kindness. Not only does kindness have a domino effect but also a reverse domino effect; if a stranger were to pick up the newspaper that you dropped on the tube, then not only would your mood and the possibilities of you carrying out an act of kindness be improved, the stranger would also feel good about themselves and be more likely to repeat the experience. Indeed "When you give yourself, you receive more than you give" (Antoine de Saint-Exupery), so being kind to somebody else is in fact a very effective way to ensure that you are kind to yourself. When acts of kindness are carried out, the giver and the recipient (be it another person, a group of people, a living organism or the environment) both benefit and are all likely to be happier and more effective in their purpose, existence or function. At this point it is essential to establish that a true act of kindness is something that is done without expectation of something in return- lest it be confused for something else. For example, at a glance, it seems that kindness is practiced throughout the animal kingdom widely and regularly. Take the chimpanzee that spends hours of its day grooming others around it, something which seems like a kind and selfless act. However, this is done not fully out of kindness, but rather in the expectation that it will be groomed in turn and also to affirm its position in the hierarchy of the troupe. Therefore, from the purely evolutionary perspective kind acts in the animal kingdom can more realistically be viewed as reciprocity, a phenomenon found in all social animals whereby individuals perform altruistic acts borne of the selfish calculation that these will come to benefit themselves in some way in the future. This is what differentiates their societies, and their ability to be kind from ours, because it is we who have the ability to carry out truly pure and generous acts of kindness. Not only paramount to society, kindness is a uniquely human attribute. The fact that we as human beings are capable of kind acts which have no clear material benefit to ourselves means we can try to create something beyond simply survival. We can elevate ourselves as a species both morally and spiritually, and attempt to transcend purely selfish motivation, unlike all other groups that social animals form. Perhaps alongside language and cooking, kindness defines us and sets us apart from all other life on Earth, it separates the nature of human society from that of a pack of dogs. It seems then, that the ability to really demonstrate kindness is the responsibility of each and every single human who wishes to be part of a society. And we do not only have a responsibility to be kind to each other. As inhabitants of this earth we also inherit a huge responsibility to respect and care for the environment and its creatures (now more than ever), and even small acts of kindness can have a definite result. For example, UN figures suggest that meat production puts more greenhouse gases into the atmosphere than transport, so simply taking part in the international campaign 'Meat free Monday' and making a small sacrifice could have a huge impact. By abstaining from eating meat just one day a week, you would perform an act of kindness and a mark of respect towards the environment by helping to combat climate change, not to mention it being good for your health. 'Wherever there is a human being, there is an opportunity for kindness' (Seneca), and we have established that this opportunity is in fact a privilege and the reason as to why we as humans can live as we do. So perhaps we should ask ourselves if we are exercising our privilege and responsibility enough. It is one of the most valuable gifts, bound by no scale and which we can all afford at all times. In our ability to carry out kind acts we are all equal and there lies the immediate value. We feel good, and we see ourselves making other people feel good. It is impossible for any of us to be perfect, but by carrying out more kind acts we can all be better people, making up a better world. There was a question on my Page : "How can life be magical?" My response was: "It's up to you whether life is magical or not and according to your belief/expectation so be it." It's not the first time I've been asked that question. Some people have asked me whether I experience constant wonder because I am highly evolved, a great soul, or one of God's chosen people? It's because I'm more superior than the rest of you lowly mortals. On the bus this morning, when this passenger got on I noticed instead of choosing one of the many vacant seats available, he came and sat right in front of me. I'll refer to him as A. A few minutes later another passenger, B, got on and he recognised A and sat across him. After saying hello, A asked B what he was up to and B said he was off to England shortly but he was still having problems with his visa. A suggested that when B goes to the office to ask for his mother who actually works for the same company. A said his mother will help him sort out his problem. B said God must have arranged their journey. Now it made sense why that guy had chosen the seat in front of me. I believe if you want to experience more wonder, you have to expect them to happen any time, any place and everywhere. The wonderful thing about sharing my experiences is that others start to notice and expect them too. 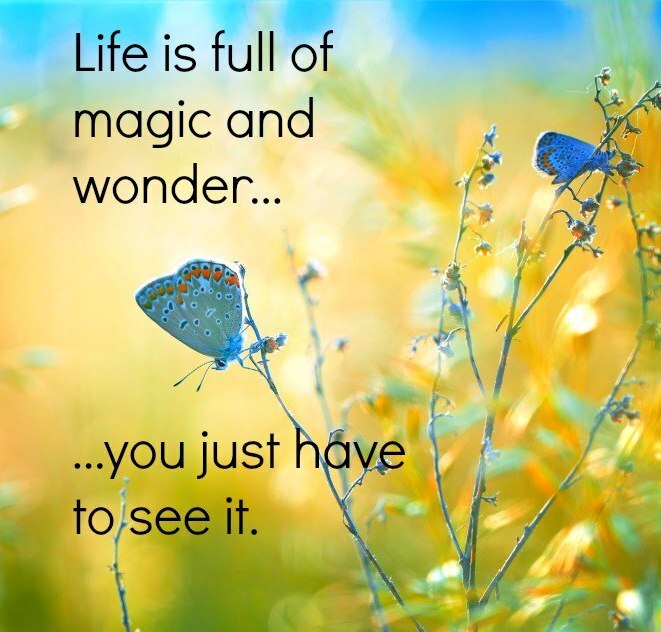 Life is full of magic and wonder.